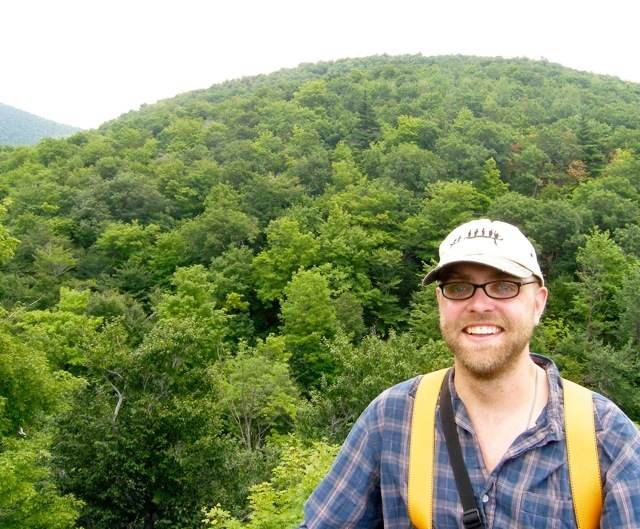 This is the final post in a three part series about studying canopy arthropods in Quebec. Part 1 was about canopy access and Part 2 was about patterns of diversity. This post is about ecological interactions in the canopy. I had the pleasure of supervising a M.Sc. student, Kathleen Aikens, who was keen to work on a canopy project that looked deeper into some of the ecological interactions occurring in our deciduous forest canopies. This was possible since we had, by this time, acquired a lot of base-line data on arthropods in many strata of the forest. Kathleen’s work included using exclosure cages to see whether or not bird predation might affect arthropods in the Canopy differently than in the understorey. This was exciting work, as it took our laboratory in a new direction, and lets us start to unravel some of the complexities of the food-webs in the tree-tops. Her main result was that birds did have a strong top-down effect on arthropods, and that effect did differ as a function of height. Using some bait trials, we also found that predation by arthropods on arthropods was also stratified. This research suggests that arthropods living in trees in our region of the world are always under significant predation pressure, from both vertebrate and invertebrate predators. 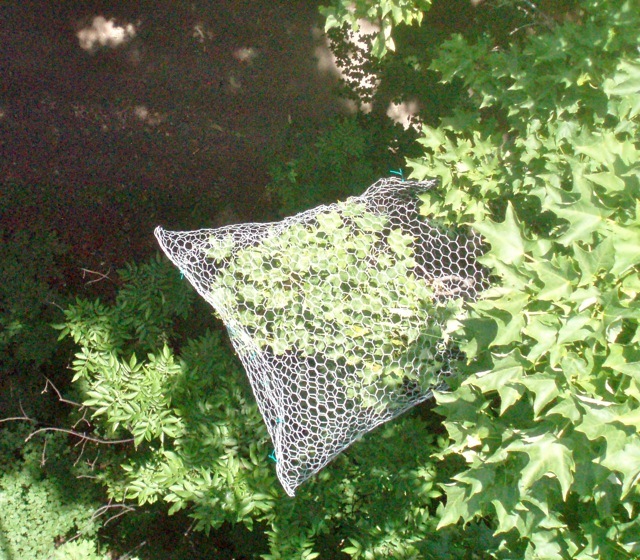 A cage experiment, to assess the effect of predators on insects living in the forest canopy. More recently, my laboratory has started to collaborate closely with another group at McGill studying “ecosystem services” – this is work done with Elena Bennett, another colleague at McGill University. The research framework with this project is about how different ecosystem services are affected by the fragmented landscape that occurs in a large region just south of Montreal. Elena and I co-supervise a PhD student Dorothy Maguire, who is looking at the ecosystem function of insect herbivory, and studying how herbivory varies as a function of forest size and degree of isolation (i.e., from a large contiguous forest), and she is studying herbivory in the understorey as well as the canopy. Herbivory is closely linked to ecosystem services because of its effect on nutrient cycling, forest aesthetics, and more. Although this project is currently underway, Dorothy is uncovering some interesting results, already. For example, she is finding that levels of insect herbivory differ between the understorey and the canopy, and that forest fragmentation is affecting insect herbivory. I have provided some highlights of some of the work that our laboratory has done in Quebec’s deciduous forests (and my apologies to the students who I didn’t mention!). Although we have come a long way, and uncovered some interesting research results, I still feel that the work is just beginning. For example, the bulk of our work has been on only two tree species (Sugar Maple and American Beech), and we have only studied a fraction of the arthropods that exist in the canopies of our forests. I would like to expand the research to include other plant-feeding guilds, bees and wasps. I’m also always curious about the piles of dead and decaying leaves that we find nestled between the crotches of high branches – these micro-habitats surely contain suspended soil (e.g., see Lindo & Winchester 2007), and within those “islands” there should be a host of arthropods. Not surprisingly, the forest canopies in southern Quebec are home to a marvelous diversity of arthropods. It’s a scientist’s model system, and a delightful system in which to work and play. Me (Chris Buddle) above the canopy at Mont St Hilaire!